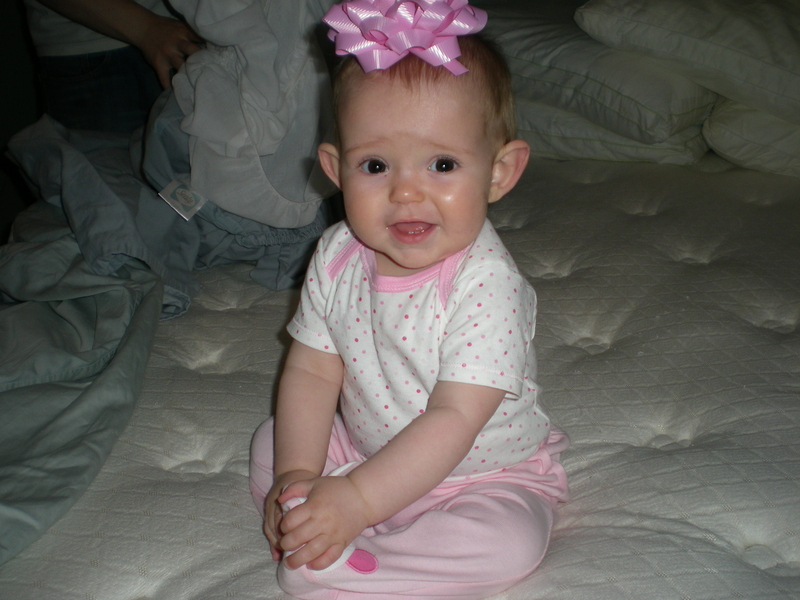 When we first had Nora, we didn’t really have a plan for sleep. There was a pack’n’play with a bassinet in our room, but I was also open to bed sharing; I figured I would just see how things would go. I knew for sure I was not down with “cry-it-out”. Well, we didn’t make it out of the hospital before I started co-sleeping. She was inside me for 42 weeks; there was no way I could sleep with her in a plastic tub, even right next to my bed. So we started co-sleeping for my own security, and once I figured out how to lay down and breastfeed it was a done deal. Given a choice between adjusting a little and attaching a baby while still half asleep or waking up, getting her out of her bassinet, nursing her, and putting her back to sleep all before going back to sleep myself, seemed like a no-brainer. In addition to getting more sleep, cosleeping made the adjustment back to work easier, because I knew she was spending every possible moment with me while not at the babysitter’s house. Because it was so easy to nurse her in our bed throughout the night, I never felt that bothered by her waking or had any reason to try to change her body’s natural rhythm. We happily co-slept for the first nine months of Nora’s life. 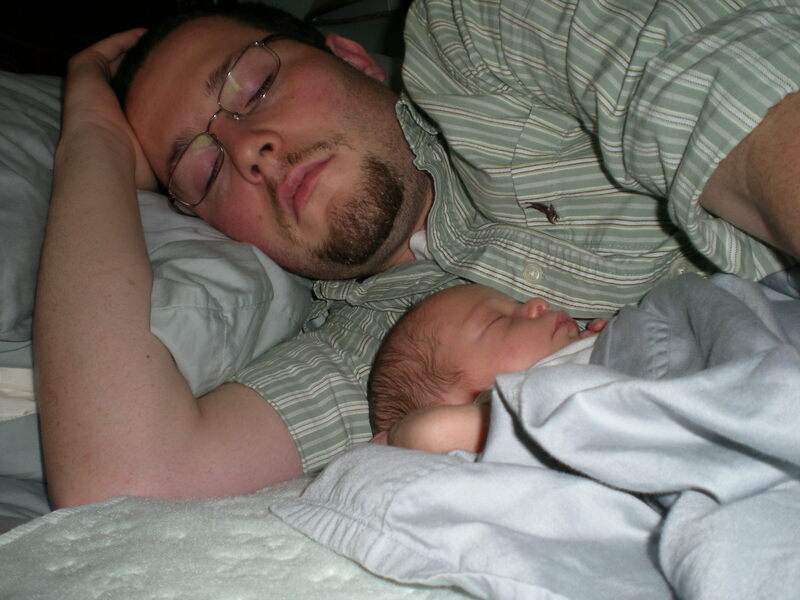 In June, when we moved to Nantucket (and back in with Chris, who had moved a month ahead of us), it was clear that co-sleeping wasn’t working as well anymore. Nora and I had gotten used to having our queen-sized bed to ourselves, adding Dada back in made it feel incredibly cramped. Space issues combined with her increasing mobility made me nervous about letting her sleep on the bed, especially since she finally was going to bed earlier than us. We decided it was time to introduce the crib. Of course I still valued my sleep, so I decided to nurse her to sleep, put her in the crib, and then bring her to our bed whenever she woke up (rather than nursing elsewhere and putting her back in the crib). Within a few weeks, Nora slowly reduced the amount of times she woke up at night, until she slept in the crib from 8 pm until 5 or 5:30 am…and that was that. We’ve had times during which she’s woken up more frequently at night, but in general she’s been an incredibly good sleeper. I guess we really got lucky, and got the perfect nighttime (all the time!) baby…which is why we thought the toddler bed transition was a good idea. Two weeks later, we have learned a very important lesson: don’t mess with a good thing. Or maybe two lessons, the second being: Nora is not ready for a toddler bed. It turns out that having the ability to get out of bed meant that she was getting out of bed at every little thing, which meant she spent a lot of time nursing at night, which she hasn’t done for months. This is where I say that I had lots of opportunities to practice Housewife Challenge #5 the last few weeks. I’ll admit, I’ve gotten quite used to not having toddler underfoot from 8:00 on; it’s in these hours that I clean the house, work on the computer, and just relax, and I was pretty jealously guarding that time. I had to work very hard on patience when my plans for the evening were interrupted. But being a parent doesn’t end after 8:00. As much as I wanted to say I was done after a 14 hour “shift,” I needed to help Nora get through the nights. The first two nights she woke up twice and I put her in her bed the first time (after nursing) and then brought her to our bed the second. After that, she was out of bed four or five times before coming to our bed. Not only was I not accomplishing the things I wanted to do, I also was not getting much sleep with a nursing toddler sprawled across me all night. The constant nursing was starting to get physically uncomfortable, so on day five, I decided to try an attempt at night weaning. You can imagine how well that went over. On day six, Chris tried putting her back to sleep, which was also met with tortured screams. We tried using a bed rail. I even tried (this will sound horrible) holding her bedroom door closed so she couldn’t open it when she got out of bed within minutes of being put in (she got mad about it for about three minutes and then fell asleep on the floor, but woke up when I moved her to her bed). For the next few days, we were a co-sleeping family again…but no one was happy about it, including Nora. She had gotten so used to having her own space, that she was also feeling too cramped in our bed. 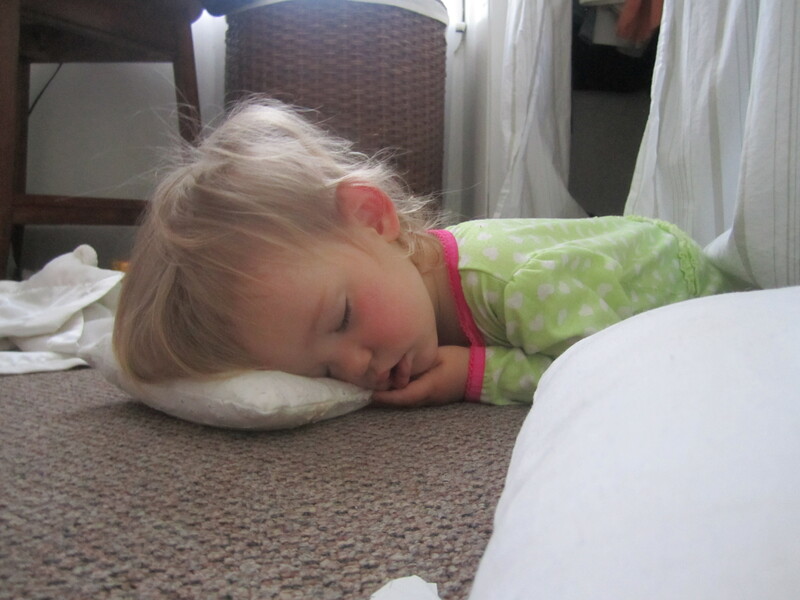 There were a few nights when she actually climbed out of our bed after nursing and tossing and turning, and then put herself to sleep on the floor. Finally, Wednesday at nearly 1:30 in the morning, we decided to put the side back on her crib…and instantly, it was better. Like magic. She didn’t wake up again that night and has slept through the past two nights. For which I’ll admit I am incredibly thankful. I hate that I struggle so much with being available to her at night time. I definitely do what needs to be done, but that’s basically it, and I’m certainly not my usual positive self about it. It’s something I have to keep working on for sure. We’ve ended up with two queen sized beds and five of us sleeping together. (There’s no space for anything else but the beds!) There is nothing worse than feeling cramped at night. And sleep deprivation is cruel to mothers. I know what you mean. I feel suffocated if any of the kids lies on my tummy. (Actually the nine year-old bruised my ribs last time he tried!) Have you tried a mattress on the floor for her? It sounds to me like cosleeping might be the answer, if you could get a bigger bed. But I am a big believer in cosleeping. It has worked for us. Cayce and I sleep in an extremely comfortable Queen and Dada sleeps in his own bed upstairs. In a sense, now that Cayce is an active but still nursing toddler, his nighttime needs are even greater. During the day we are very busy exploring the world. Nighttime is an opportunity for sweet comfort and nursing, as well as sleep. I feel that this has given Cayce a great sense of security, and reinforced his outgoing personality. I’ll admit I don’t have much of a night life– I usually go to sleep not long after I’ve gotten the baby down– but we get to rest and refuel for another day of adventure. I guess I’ll get my nights back to myself when he’s a little older. No, I don’t think that co-sleeping is the best thing for our family anymore. I do a lot of work at night (sometimes until 1, 2, or 3 in the morning), which is one of the ways that we can afford for me to stay home. With the computer only feet away from our bed, it would definitely disrupt Nora’s sleep. And because I get so little sleep, it has to be quality sleep. I also think that being in our bed doesn’t work for Nora anymore. She nurses more, because she’s not sleeping as deeply and is uncomfortable. I think the fact that she was getting out of our bed to sleep on the floor and the fact that putting the side back on her bed was all it took for her to start sleeping through the night again (zero crying involved!) says a lot. I’m a huge advocate for bed sharing, especially with a young baby who has to nurse at night. But I also think that different things work for different families and I’ve discovered that for Nora (who knows about future babies) sleeping in our bed as a toddler just isn’t it. aria has always had her own bed (minus two nights that she slept with me) and then with the 5 in the morning feeding she’d stay in bed with me for about an hour and a half. other than that, she’s on her own, and it’s worked. there were a few weeks at the beginning that were horrible, but after that we were good to go. I have a lot of sleep disorders, so having a small child with me is not an option, and she goes to bed really early and I read every night before bed, in bed. it just works for us. I also can’t imagine not sleeping with my husband. I got him first and our relationship is more necessary for stability than a sleeping relationship with a baby. moral of my giant post: co-sleeping is not for us.